Yes I have Three accounts, 1 I had forever, the second was so I could make an avatar based off of the real me and now I have this one. This one is just an extra but I have decided I wanted to make her dressed up as my OC Gemsona character Prysm. I might consider making her dressed up as another OC of mine but right now I prefer wonderful rainbow. This account is basically just my extra, I do not plan on posting in any forums with this account. 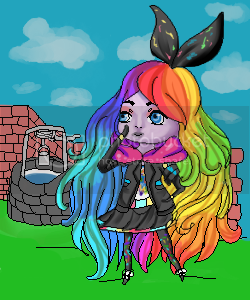 I mainly plan on just dressing her up, buying rainbow items( and currently those Super Prize items XD) and selling any and all Items that aren't rainbow or I can't mixed with rainbow or wont work with my other two Avatars. Not the Cold part - I haven't had the misfortune to have one in years! I've never been to Disney World! Disneyland -yup! Lots. I hope you get to feeling really good - like, overnight! Way, WAY too much snow, clouds, etc. And not nearly enough Sunshine! "We Are The Crystal Gem!